What do I do with the school listing on the My Schools page? You will see a list of schools based on the parameters you set. By default, none of the schools is selected. 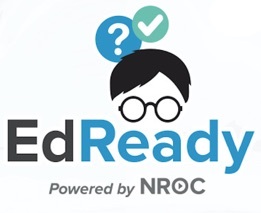 To select a school and include it in your study options (later in your use of EdReady), click in any of the open circles before the school name – you will see a check mark appear, indicating that school has now been selected. You can select or de-select school at any time. If you change your location or search for specific schools, your prior selections will be retained and included in any subsequent listings. If you click on the “i” after the school name, you will get an overview of key statistics about that school. Close the overview screen to return to selecting schools. Click “Save and continue” when you are done selecting schools. How do I know which study path to choose (if there is more than one available)?